How Much Does a Truck Camper Cost? A truck camper, also known as TC, is not a vehicle on its own, but a camper specifically designed to fit over the cab of your regular or long-bed pickup truck. It is sometimes referred to as a slide-in or cab-over camper. These campers are versatile and loved by many for the ability to go anywhere your truck can go. Truck campers, because there are fewer of them, hold their value. If looking for new, expect to spend in the range of $5,000 up to a high-end of $60,000. A used model will range between $2,500 and $30,000 depending on the age, condition, options and manufacturer. Manufacturers recommend having at least a 3/4 ton pickup due to the payload capacity. Tie downs and turn buckles are what attaches the TC to the bed of the truck. It’s suggested you purchase turn buckles that are spring loaded which will absorb more shock when driving on a bumpy or off-road situation. You will also need a rubberized bed matt in the truck to protect the camper from sliding around in the bed of the truck. Ensure the lights of your truck are hooked up properly and working and you’re ready to hit the road. The camper slides out on its own legs at the campsite, leaving you the ability to use your truck for exploring, fishing, shopping or whatever you darn well please. There are approximately 18 manufacturers of truck campers in the United States. 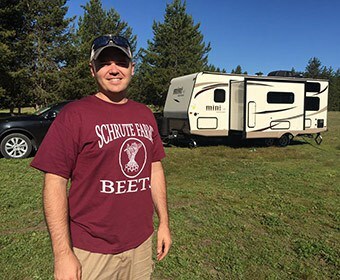 The majority are in the western half of the U.S. and you’ll find more truck campers on the road in that area of the country as well. 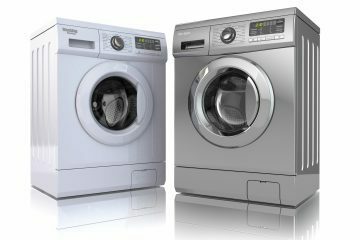 However, no matter what part of the U.S. you live in, there are many models to choose from. Here’s a sampling. Eureka SlideIn Vagabond: One of the most reasonable and lightest new truck campers around at only 900 lbs. New models can be found for $5,000. 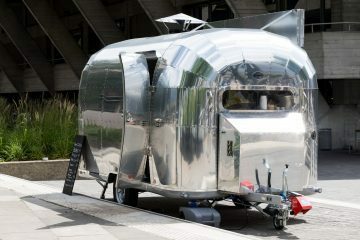 Welded aluminum construction and laminated aluminum exterior makes this camper a study one to boot. Air conditioning, small electric refrigerator, sink and microwave come standard. The design is such that you enjoy two sofas by day which convert to twin beds or a double bed at night. Interior headroom is 64”. 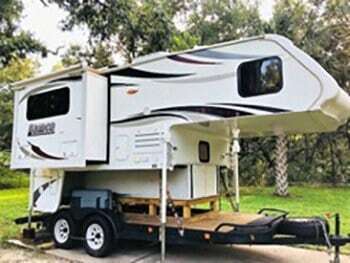 Palomino Backpack Truck Camper HS-6601: At a list price of $21,000, this camper has a lot to offer. The exterior provides a high gloss gel coated fiberglass, heated and insulated basement and aluminum frame with foam insulation. The roof is walkable. The camper is 16.6’ in length with a dry weight of 2,051 lbs. The kitchen has a single bowl sink, 2-burner stove, microwave, single door refrigerator w/small freezer and cabinets. A hot/cold outdoor shower, awning and electric jacks will come in handy. Lance 1172B: If you are looking for luxury in a truck camper, you’ll find it in this new Lance model. Don’t let the sticker price of $60,000 deter you from taking a look. It’s always good to compare, and this one just might WOW you. 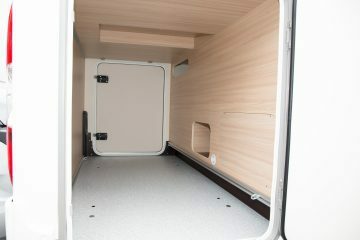 With an interior length of 11’11” and dry weight of 4,174 lbs., Lance packs a punch with its one slide truck camper. You got that right—there are truck campers with a slide. The room it provides is awesome. You’ll enjoy a separate dedicated bedroom with closet and a full bath including shower. The living area has a 4-person dinette in the slide with under bench storage, and a comfortable sofa awaits you, as well. Quality abounds in the kitchen with beautiful cabinetry, 3-burner cooktop w/oven, 3-way stainless refrigerator, large single sink and pantry. Lance offers so many features in this truck camper, you’ll be livin’ large. Search for a camper that will fit your truck, that is if you already have the truck, and one that does not exceed the payload capacity. That helps narrow your search. You can then decide what you want in a truck camper and go from there. A few used TC’s are listed below to provide a condensed idea of what’s on the market. 2006 Arctic Fox 860 Silver Fox Edition w/slide: This “For Sale By Owner” truck camper has a 16’ exterior length and quite a bit to offer at a $10,000 price tag. The kitchen has considerable room to it, with a large sink, stove/oven, microwave, cabinets and full-sized refrigerator. The dinette for 4 sits in the trailer’s slide out. The bathroom has a toilet and sink. The holding tanks are generous, and this camper comes with A/C as well. The exterior is a one-piece laminated fiberglass with a 3” crown roof. A 4-season insulation package and enclosed heated holding tanks round out this TC. At a dry weight of 3,716 lbs. the Arctic Fox is known to be a good quality manufactured unit. 2015 Northstar TC800: This 8’ floor length truck camper has the ability to fit in a long bed or short bed truck. When optioned with a full wrap, it will add lockable side storage compartments and built-in tail lights to correctly fit a short bed truck. This model retails for $15,986 with a dry weight of only 1,510 lbs. The roof extends with a manual crank to increase the interior height to 6’7” in total. The fantastic fan actually helps in closing the canvas roof portion making it an easy, one-person job. The kitchen has a 2-burner stove, single sink and refrigerator. The sofa/dinette makes into additional sleeping space, while the bedroom gives you a queen-sized mattress with floor storage on each side. There is additional cabinet storage near the sofa. Next to the fresh water tank there’s room to store a generator or porta potty. 2017 nuCamp Cirrus 820: Attractiveness and quality first come to mind when you set eyes on the Cirrus 820. nuCamp builds its TC’s with materials such as the Alde hydronic heating system, Infinity flooring and the Froli sleep system, not found in other truck campers. This used model retails for $25,900 with a dry weight of 2,540 lbs. The Cirrus’ overall length is 17’4” with a floor length of 8’6”. The holding tanks are large, A/C unit is 9,200 BTU’s and an outdoor ladder makes it easy to access the truck camper’s seamless aluminum roof. The dinette is comfortable with a drop-down table to make a youth bunk. Top notch appliances round-out the kitchen including a 2-burner stainless glass top stove, stainless sink, 5 cu. ft. refrigerator, microwave and storage cabinets. This unit includes a full wet bath. There are many options available, but this TC is sold with a 160-watt solar kit included in the asking price, making it oh so easy to boondock. Truck campers are easy to store, easy to carry and efficient when it comes to fuel mileage. Enjoying time outdoors is what got us all camping in the first place. With a truck camper, you’ll have plenty of outdoor time but a place to retreat for the evening or a needed chill day. A TC also makes perfect sense if you wish to haul a small boat, an enclosed trailer for carrying additional camping equipment or taking along a motorcycle, golf cart or ATV. It’s important to ensure the truck’s payload capacity and size prior to purchasing a camper or when you will haul additional items. Know the total weight you’ll be towing. 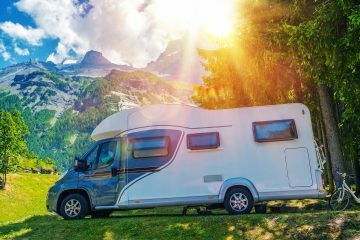 Get an idea of the fair market value for new or used truck campers by checking dealer websites, RV classified sites, or even Craigslist. With added knowledge, you’ll be prepared to make a deal. 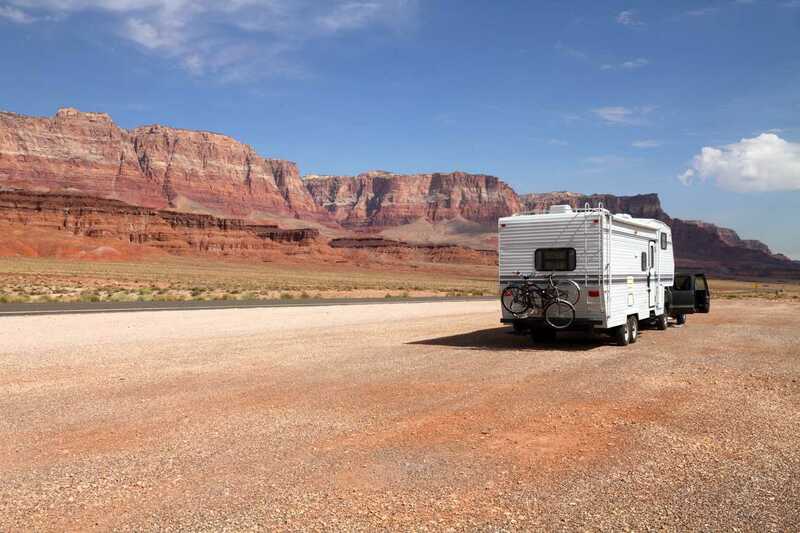 If considering a used camper, ask about any damages, water leaks, repairs, upgrades, and the like. An RV technician can do a thorough inspection. 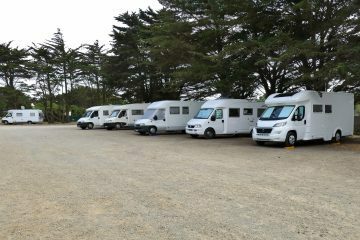 When purchasing from a dealer, you have more assurance that the camper has been inspected and is in good working order. An honest dealer should be up-front about the camper’s condition and repairs. When truck camper fever strikes, you’ll be as prepared as you can to find the TC that works for you! Good article. I’ve been looking into truck campers to use for travel as well as for a bug out vehicle addition. Thanks for putting this together. Thank you for your article on truck campers. It was very helpful, but left me with some questions. What is the overall interior height limit on these models? One of your featured models has a capability of reaching 6′ 7″ which is great cause I’m 6′ 3″. Is this height uncommon? What about the size of the bathrooms. At 285lbs I’m not a small guy but love space to fit in the “library”.